I recently spent a week on Martha’s Vineyard with some friends and had an incredible time. 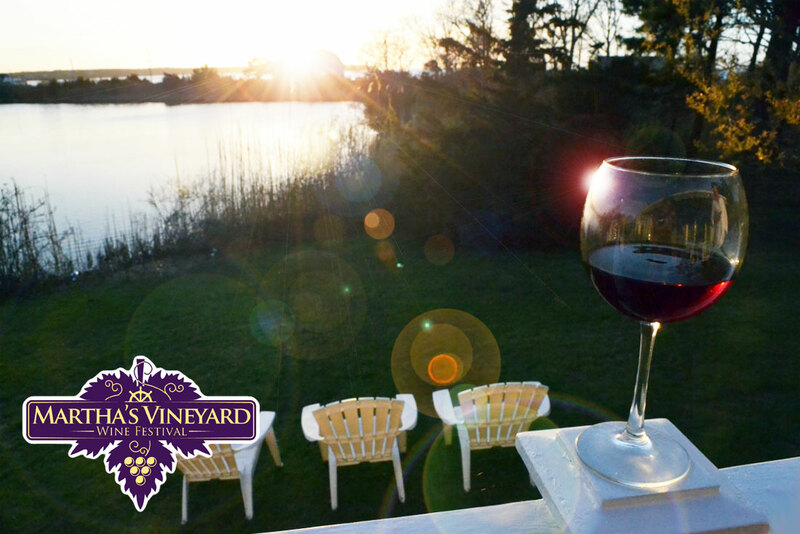 During the time I was there, the Martha’s Vineyard Wine Festival began. It was truly kismet! The unfortunate thing was that the Festival began on Thursday night and I was leaving on Saturday morning. 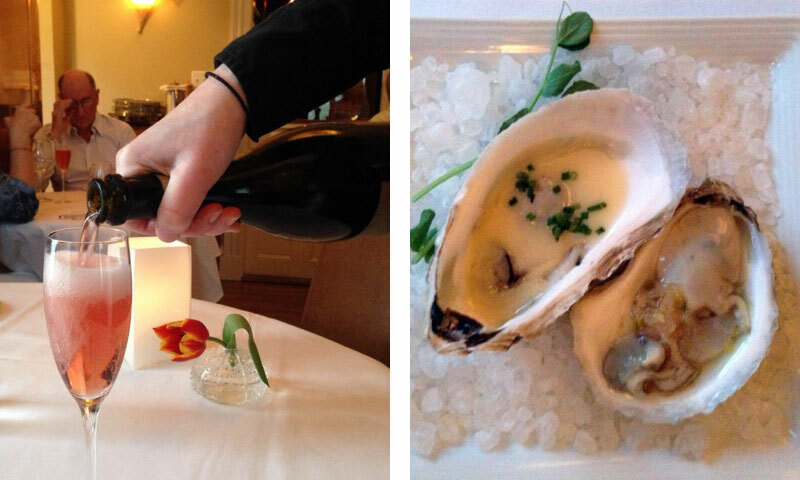 So the only thing we could do was go to the Soter Winemaker’s Dinner at “l’étoile” Restaurant – a fantastic French restaurant located in Edgartown. It is touted as “Contemporary Casually Elegant Fine Dining and Martini & Wine Bar” and serves “Fresh Seasonal Regional Cuisine with a French Touch”. 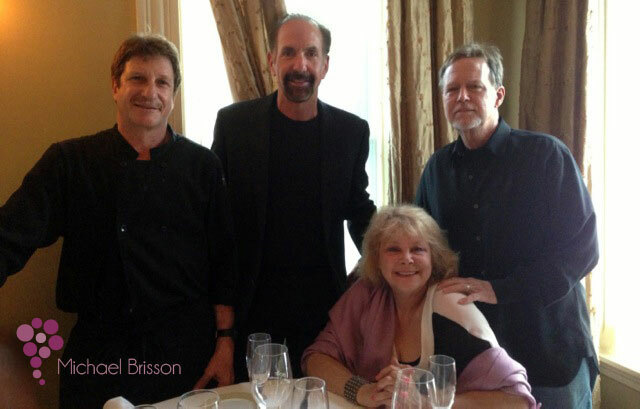 Chef & Owner Michael Brisson, a self-taught “cook” (as he says) put together an amazing menu that beautifully complemented winemaker James Cahill’s wines from Soter Vineyards in Carlton Oregon. If you never have been to a winemaker’s dinner, it is something I highly recommend. Before I get into the dinner, here is a little background on Soter Vineyards. Tony Soter founded Etude Wines in 1982. Its name, “study”, is the word that characterizes his respect for the ongoing process of learning about winegrowing. During the mid-1980s, he worked as a consulting winemaker to Napa Valley’s Shafer, Niebaum-Coppola, Spottswoode and Dalle Valle. 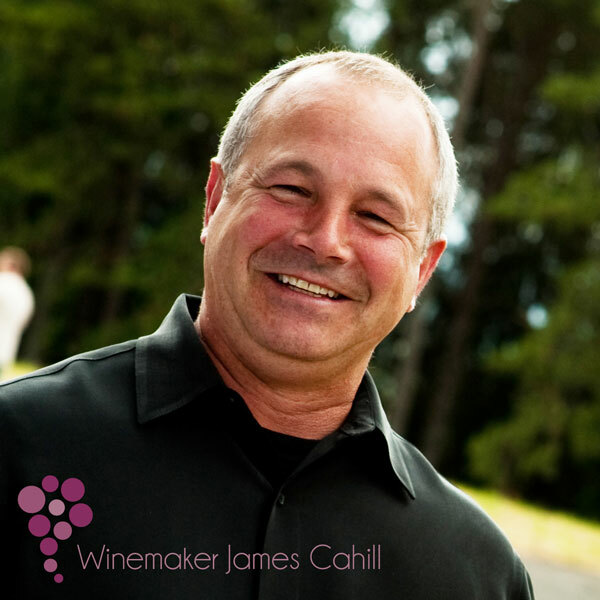 After ending his consulting with these wineries, he shifted his focus on Soter Vineyards and his family. His partner is his wife, Michelle Soter, who holds a Marketing degree from LA’s Loyola Marymount University. Winemaker James Cahill has worked in the Oregon vineyards for almost two decades including five years as Assistant Winemaker and Operations Manager at Soter’s neighbor, Beaux Frères. • Now back to the dinner. The evening started with the 2009 Soter Estate Grown Brut Rosé ($55) sparkling wine – a magnificent flavorful, sparkler that has great balance. Its rich pink color is appealing to the eye, and its delicate flavors of honey, vanilla and subtle strawberries and cranberries taste wonderful. This was paired with Katama Bay “Signature” Oysters done two ways: Warm with Rosé Champaigne Beurre Blanc; and Chilled with Citrus Mignonette (made from shallots, pepper and vinegar). I am not normally one who eats oysters, but I had to taste them. 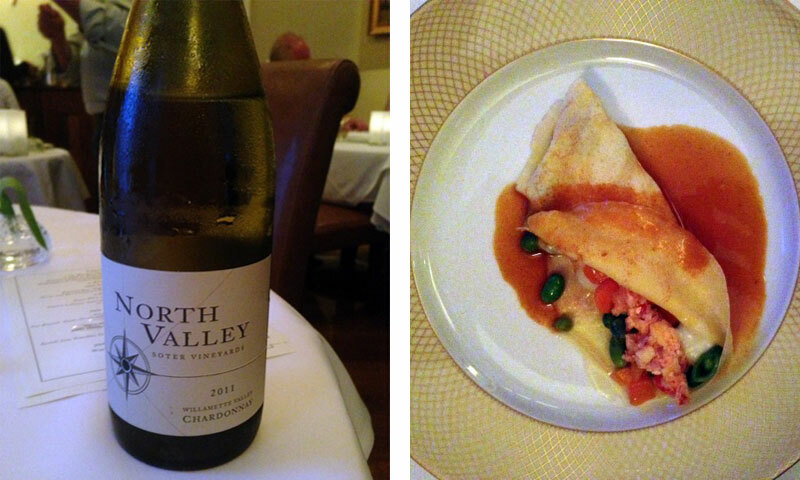 • The second course started with the pouring of the 2011 North Valley Chardonnay ($30) – their very first Chardonnay. Sourced from two vineyards – Eola-Amity Hills and Yanhill-Carlton AVA – the wine is barrel fermented but mostly aged in stainless steel tanks. It does have a tropical fruit and honey taste, and because of the short amount of time it is aged in wood, it is more crisp and citrusy than buttery and oaky. According to Winemaker Jim Cahill, “This represents a renaissance in the promise of New World Chardonnay and pays homage to the Burgundian precedents in Chablis and Mersault.” This was paired quite beautifully with Native Lobster, Sun-choke Purée & Spring Vegetable Crêpe. As I have mentioned in other posts, I usually like my Chardonnay more oaky and buttery. But in this case, the citrusy and crispness of the wine worked great with the lobster crepe. As a matter of fact, upon talking to Chef Brisson, I learned that after he tasted the Chardonnay, he changed his menu at the last minute. • The third course started with the pouring of the first of three Pinots. I must admit that I am not very familiar with Oregon Pinots… or Oregon wines for that matter. So I was excited to learn more. The 2009 North Valley Pinot Noir ($30) was paired with Fresh Cavendish Farm Quail – pan-roasted, maple glazed with a dry cherry, hazelnut & kale filling on parsnip puree. Okay, this isn’t meant to sound overly pretentious. I’m just letting you know what the menu was. 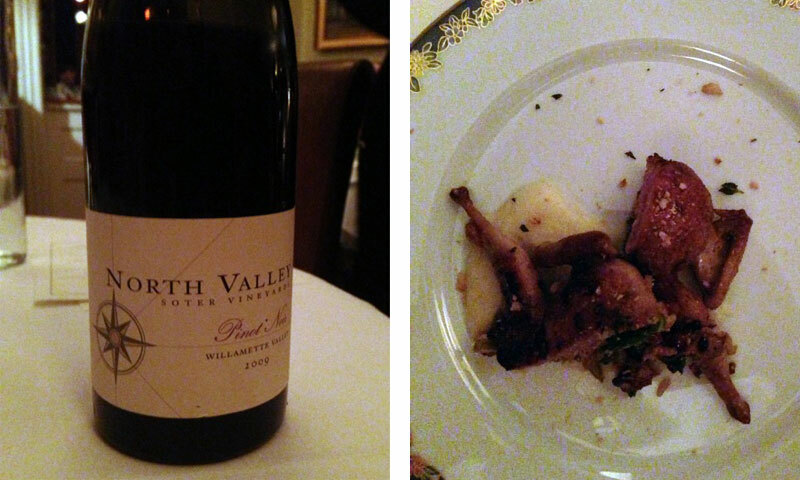 The earthiness of the Pinot (coming from the Willamette Valley) and the quail was a good combination. • The next course consisted of pairing the 2010 Mineral Springs Ranch Pinot ($50) and 2009 Mineral Springs Ranch “Reserve” Pinot ($85) with a Trilogy of Spring Rabbit: Ravioli Yam, Pistachios, Grilled Loin, Chop-Beach Plum Onion Jam, Confit Leg-Rabbit Jus. 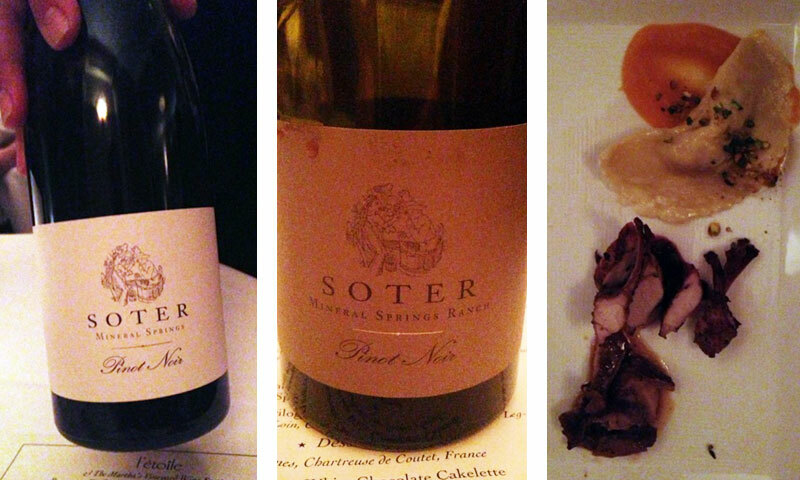 Yes, rabbit sort of tastes like chicken… These Pinots were definitely a step above the prior course’s Pinot. But then there is a difference in the price and the aging. The 2010 Pinot is a “reflection of a classic Oregon vintage that delivered ample wines with both density and purity. Ruby red with brilliant clarity, this wine reveals aromas of spice, raspberry and cranberry fruit and a classic Oregon earthiness.” The 2009 Reserve comes from the “tenderloin of the vineyard”. This is where the winemaker knows they have something very special in the fruit and isolates the best of it to make a special wine. Only 430 cases produced. Wine Advocate gave both of these wines 93 points. • The last course was dessert. For those that go for this sort of thing, a warm flourless white chocolate cakelette was served with fresh citrus-blueberry labneh – which is strained Greek yogurt. Since I don’t do chocolate, the chef made an espresso crème brulee for me. That worked… This was all served with a 2009 Sauternes – a (white) French dessert wine. What is great about a winemaker’s dinner is that you get to not only have wine paired wonderfully with food, but you get to learn about the wine and the winemaker. You learn about their philosophy, their sensibility and their experience. And then you get to taste what they’re talking about. Not all Pinot Noirs are created equal. This dinner was an example of tasting three Pinots from the same winery and winemaker. And understanding and tasting the differences. It’s a great experience. Refreshed a great memory for me. That was a fun night. Hope chef is having a great summer on the island. Steve. I love this article. That was such a fantastic night to celebrate the island tastes and of course, your birthday. So glad that you are doing this blog. It’s really helping us find the right wines. Thanks and keep it up. PS. 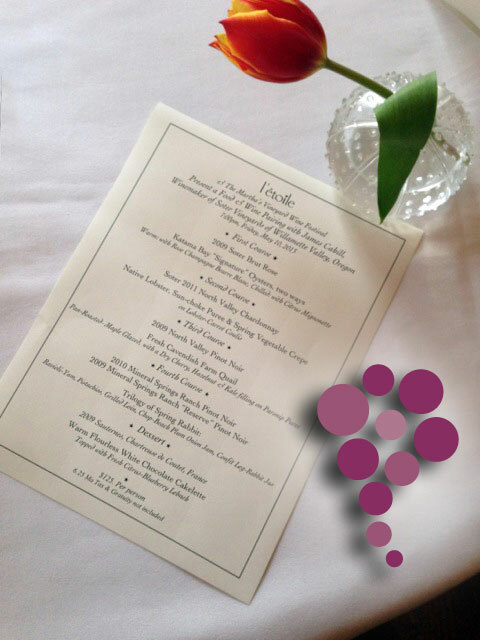 The Vineyard awaits with great tastes from Michael at L’etoile. We plan to be back this fall. Great article! Thanks for the memory, been a long busy season since that event. I had a blast and am happy you and your crew enjoyed it so much.